Finding the best plastic surgeon is increasingly becoming difficult. More than at any other time in the past, today it is essential for anyone seeking a plastic surgeon’s services to know how to identify the best in the field. While many advertize as plastic surgeons, not as many are board-certified in plastic surgery. Even fewer are members of plastic surgery societies. These two are major things to look out for when scouting for a plastic surgery. Other important qualities include the surgeon’s reviews and past results. Mahlon Kerr has all these qualifications and more. He is a respected plastic surgeon based in Austin, Texas. The mere number of people who stream into his practice will give you an idea of just how competent the surgeon is. 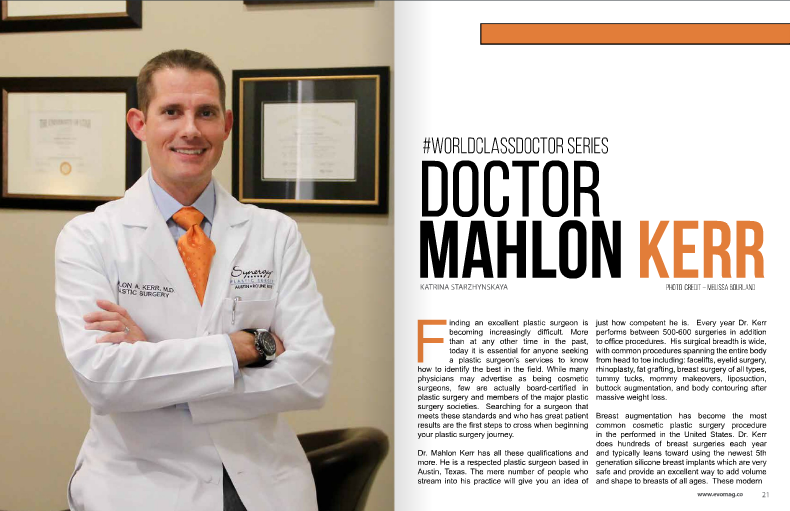 Every year, Doctor Mahlon Kerr does anything between 500 and 600 procedures every year. 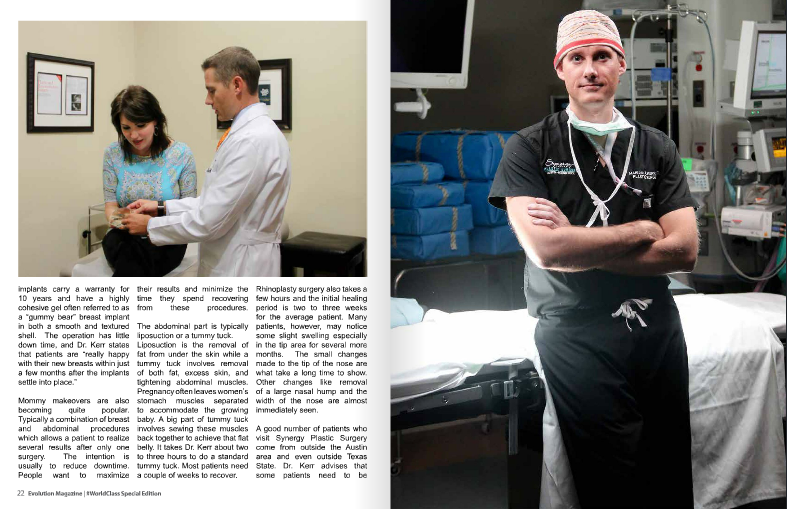 Dr. Kerr does breast reduction, breast augmentation, mommy makeover, liposuction, rhinoplasty and tummy tucking. Breast lift and reduction are the most common procedures in his practice, accounting for about 60-70% of his work. Breast augmentation is the most common plastic surgery procedure in the United States. Doctor Kerr typically uses silicone breast implants which are now safe and have been back in the market since 2006. He uses the six-generation implant that can last up to 15 years. This is a relatively easy operation with just a few days of downtime and the implants look pretty good within just a few months. Mommy makeover is becoming quite popular. It is a combination of several procedures done all at once. The intention is usually to reduce downtime. People want to maximize their results and minimize the time they spend recovering from these procedures. Mommy makeover often includes tummy tucking and liposuction. Liposuction is simply the removal of fat from under the skin while tummy tuck involves removal of both fat and skin. Pregnancy leaves women’s stomach muscles separated to accommodate the growing fetus. A big part of tummy tuck involves sewing these muscles back together to achieve that flat belly. It takes Dr. Kerr two to three hours to do a standard tummy tuck. Most patients take a couple of weeks to recover. Usually, a rhinoplasty takes two and a half hours. The healing time for the average person is two to three weeks. The patient may, however, note their nose is still swollen and it may take up to a year for the swelling to completely go away. The small changes in the tip of the nose are what take long to show. Other changes like the bump and the thinness of the nose are almost immediate. A good number of people who visit Mahlon Kerr’s practice come from outside Texas State. Dr. Kerr advises patients to be prepared to stay in town for a while, sometimes as long as a week. For small procedures like breast augmentation, a patient can be ready to leave within 48 hours. Dr. Kerr makes an effort to offer his clients as much information as possible so that as they fly in, they have realistic expectations of what is going to happen during and after the procedure. The information availed to clients include how much it might cost, how long they need to be in Austin, how much help they will need and how soon they would be in shape to travel back. Doctor Mahlon Kerr also does facial procedures. He says he enjoys facelifts and nasalplasty because it gives him the opportunity to change someone’s appearance. When he first moved to Texas, he was recruited to do facial plastic surgery by the hospital he is affiliated with. He says he finds facial plastic surgery quite fulfilling because of the difference this can make in someone’s life. While most of his clients are female, the number of men seeking plastic surgery is growing. Most men contact Dr. Kerr for facelifts, body contouring, and liposuction. A good number of them want to change the contouring of their chests. Last year, there was a significant increase in the number of men seeking botox. Dr. Kerr says botox and fillers are the slippery slopes of plastic surgery. Doctor Mahlon Kerr advises people considering botox and fillers to consider starting earlier in their lives – in their early thirties – to increase chances of better success with botox and fillers later in their lives. Trying botox and fillers for the first time when you are in your 60s is pretty difficult. Dr. Kerr says while it is possible to make the skin of a person in their late 60s smoother, it is virtually impossible to make the wrinkles completely disappear from their faces. Dr. Kerr works a lot. He only takes four to six weeks off every year. The rest of the time is spent at work. It helps that his wife, Ashley works with him. She is his nurse and a huge part of the practice. 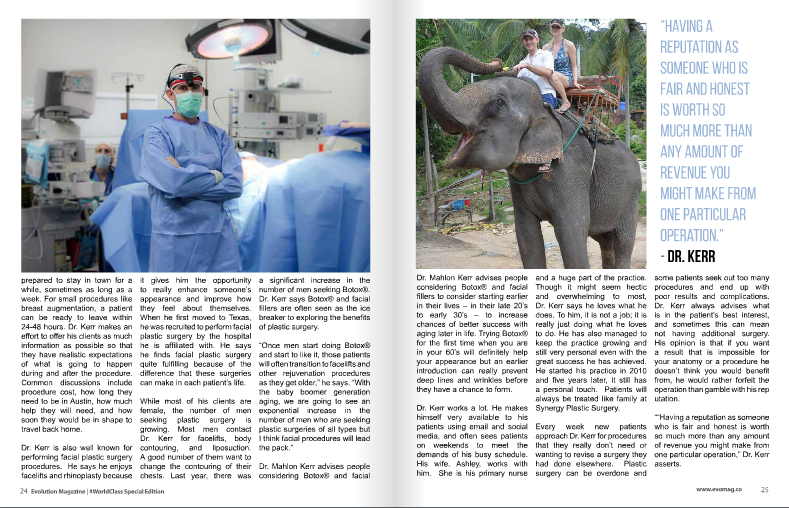 Though it might seem hectic and overwhelming, Dr. Kerr says he loves what he does. To him, it is not a job; it is him doing what he loves to do. He has also managed to keep the practice simple and personal even with the great success he has recorded. He started his practice in 2010 and five years later, it still has a personal touch. Every now and then, people approach Dr. Kerr for procedures they really should not be seeking for. Some people undergo too many procedures and end up ruining their bodies. Dr. Kerr says he tries to advise them against this approach to plastic surgery. He also says if you want something he can’t give or a procedure he doesn’t think you should have, he would rather forfeit the money than gamble with his reputation. “Having a reputation as someone who is fair and honest is worth so much more than the few thousand dollars you might make from one particular operation,” Mahlon Kerr asserts.